After the exertions of yesterday the pace slowed for day three as we conserved energy for the challenge tomorrow. The day started with more competition as we split up to tackle “command tasks”. These are tests of ingenuity, efficiency and team work designed to highlight a marine’s strengths and probably very important in the military. 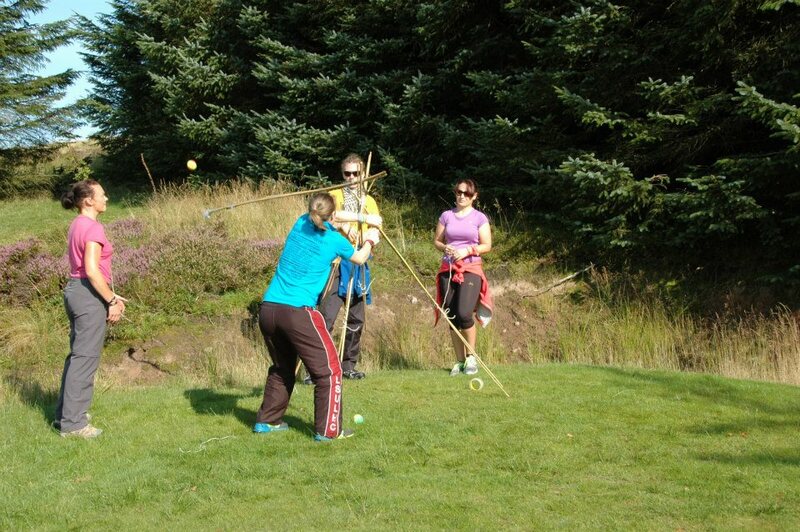 For us it was another excuse to goad each other, earn bragging rights and play with ropes! Precarious yes, but also surprisingly effective! 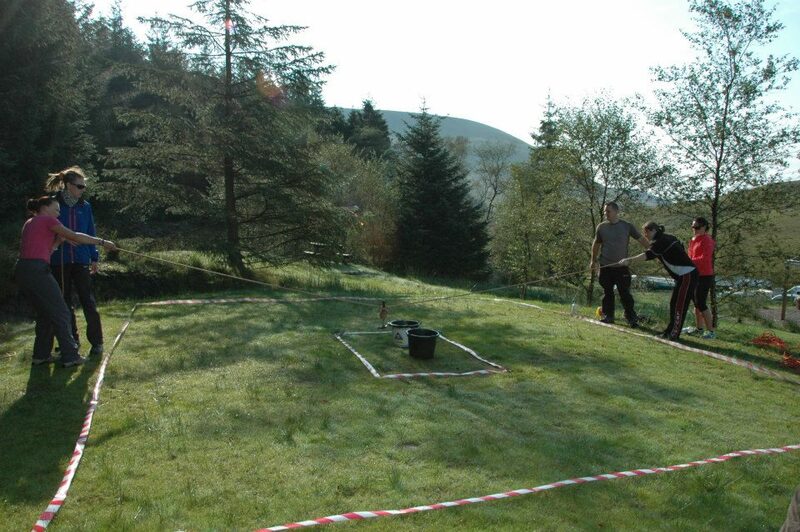 Stephen guides his team – Clive, Rachel & Brendon – through the minefield…minus a blown up Barry! Finally we had to build a weapon with a difference. Armed with bamboo canes, string, sellotape and a wooden spoon we had to launch an egg as far as possible…and hopefully catch it at the other end! Up against some very technical minds in the other team we set about the task with great gusto and not much planning, but we all had the same idea. 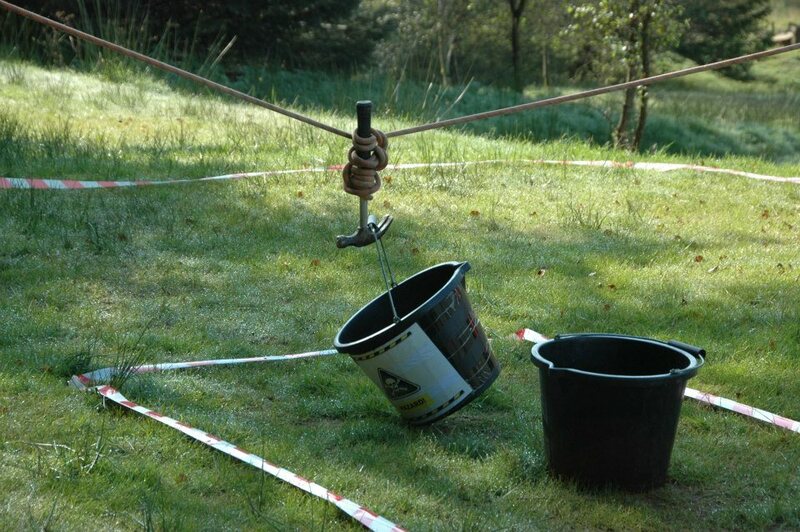 We built a four legged base, roughly sellotaped together then secured badly with string! Next we bound two canes together, taped the spoon on the end and built an ingenious cradle around the bowl of the spoon by layering up sellotape. The engineers at work. Our finished design was ugly, but effective. We had a few minutes to test our design with tennis balls…and they flew! We were launching a good 10 metres past where the other team were reaching and things were looking good. 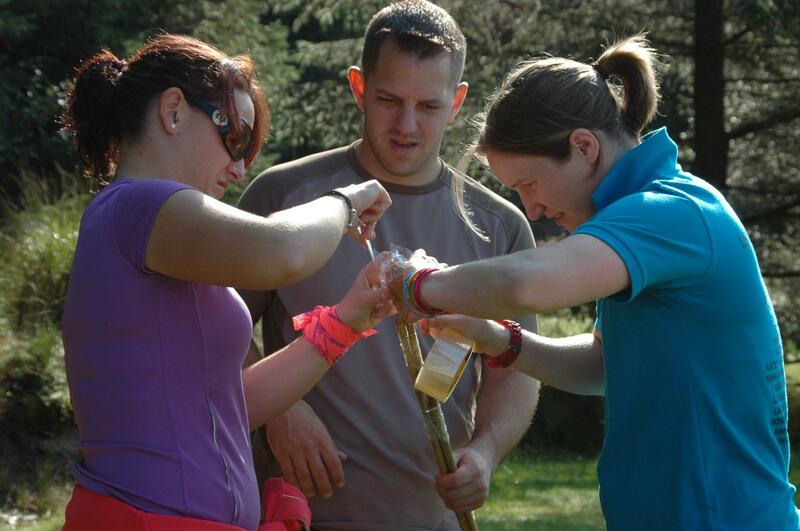 Even when Sarah snapped our launch canes I wasn’t worried, we had this competition in the bag! We let the others go first, and they managed an impressive 15 metres with their first egg. Barry came very close to catching it with a dramatic dive that owed more to looking good than doing good but was impressive all the same. With a very achievable target set we relocated our machine and prepared for victory. Practicing with tennis balls, Sarah’s technique was perfect but the design wasn’t. Sadly our perfect design had one small but fatal flaw. Our expertly crafted egg cradling spoon/sellotape hybrid had been a bit squished by the tennis ball trials. When it came to launching the eggs they stuck in the cradle for far too long and our first effort “flew” a poultry (pun intended) few metres. Spotting the problem Sarah made some clever adjustment to the launch speed and I set up for the all important catch of our last egg. Nowhere near! Sarah managed 11 metres this time but I was in no position to even attempt a dramatic diving catch like Barry. We were beaten 3- nil, our humiliation was complete. With ten minutes to get kitted up and on the road to head for survival training I was looking forward to learning how to survive alone in the woods until the shame had passed! The events of the afternoon warrant their own post and soon I’ll be writing up the survival training, which I think everyone was really impressed by and which reinforced just how skilled, drilled and ready to kill our instructors were! This entry was posted in Events, Mountain, Training and tagged Berghaus, Brecon, challenge, fan dance, Gore-tex, Pen y fan, training. Bookmark the permalink.